6500/7600s with 3BXL and 3CXL RSPs and 3BXL and 3CXL DFCs support a maximum of 1024K FIB TCAM entries. These 1,024,000 entries are each 72 bits in size and need to be split between IPv4 prefix entries, MPLS label entries, IPv6 prefix entries and mixed IPv4 & 6 multicast entries. The IPv4 entries and MPLS entries are 72 bit entries so each IPv4 route entry (or MPLS entry) uses one FIB entry space. Each IPv6 or Multicast entry uses 144 bits (double the size) so one IPv6 prefix entry uses the space of two IPv4 entries. Under the default configuration the FIB TCAM is split as 512K entries for IPv4 and MPLS (dynamically shared between those two) and 256k entries for IPv6 and Multicast (also dynamically shared between those two). Note: The VS-S2T-10G-XL supervisor engine and DFC4XL modules support 1,000,000 routes that are dynamically shared between IPv4 and IPv6 by default. Note: Adjusting the TCAM requires a reboot in order for the changes to take effect! Note: In the case of dual-SUPs/RSPs/VSS, when adjusting the FIB TCAM boundary ensure the config register on the backup SUP is set to the same value as the active SUP before rebooting to apply the changes. Otherwise at bootup the backup SUP might not read in the configuration to adjust it's FIB TCAM allocation simply dropping into a passive "slave" mode to the active SUP/RSP which has read the configuration and tried to adjusted its TCAM, although there will be a discrepency between the two RSPs/SUPs so the TCAM won't be adjusted on either. In such a case, check if the backup SUP has a confreg is 0x0 or anything other than 0x2102, "remote command standby-sp show bootvar". To force the confreg values to be the same, try the following trick on the active SUP: "conf t; config-register 0x0; end; copy run start; conf t; config-register 0x2102; end; copy run start". Note: If the number of TCAM entries reaches 100% (full) then no more routes can be installed into hardware. Packets with no matching hardware route are then software switched. 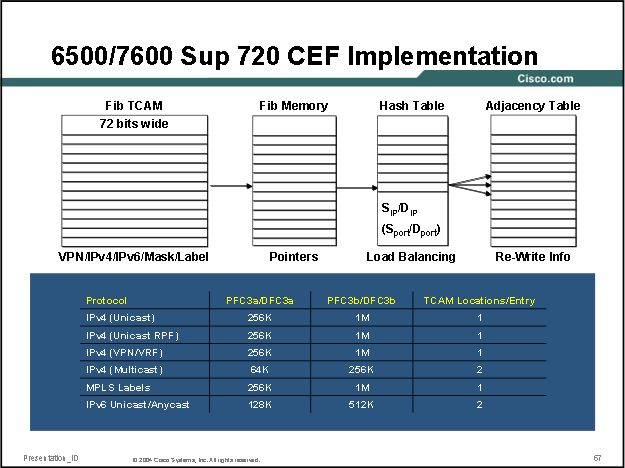 At this point an MLS cef exception flag is set and the flag cannot be cleared until the device is rebooted (even if the TCAM entry count is lowered to below 100% and all packets are being hardware processed again).This is the case for SUP720, RSP720 and SUP2T. The command "mls cef error action [ reset | freeze | recover]" (reset is default) can be used to specify the action taken in the event of a FIB exception (but the flag can still never be cleared without a reboot. Freeze - Allows each protocol to freeze the FIB error. This captures the info and helpful in event of Cisco TAC troubleshooting during system problem. Recover - Allows each protocol to recover from the generic FIB error or a protocol-specific FIB fatal error. Reset - Allows each protocol to clear the data structures and reload the FIB. FIB when a FIB error is detected. 69,120,000 bit TCAM / 72 bits per IPv4 & MPLS entries = 960,000 IPv4 & MPLS FIB size. %MLSCEF-SP-1-MAX_ROUTE_MISMATCH: Maximum routes config mismatch. Reconfigure the maximum routes values and reload the box. %MLSCEF-SP-4-FIB_EXCEPTION_THRESHOLD: Hardware CEF entry usage is at 95% capacity for MPLS protocol. The output of the command "show platform hardware capacity forwarding" can be misleading. Consider the below two examples. In the first one below the router has a shared 960k FIB TCAM entry space for IPv4 and MPLS (and EoMPLS) entries. The "show platform hardware capacity forwarding" command shows 638,057 IPv4 entries and utilisation figure of 65% (638,057 / 983,040 * 100 = 64.90%). For MPLS it shows 76,307 entries as 8% utilisation (76,307 / 983,040 * 100 = 7.76%). The IPv4, MPLS and EoMPLS entries added together are 73% used but it's important to note in the breakdown that for IPv4 the percentage figure is of the total 960K shared entries and the same is true for MPLS, 8% of 960K entries but the total usage is 73%, despite saying 8% for MPLS there isn’t room for another 10x MPLS labels.